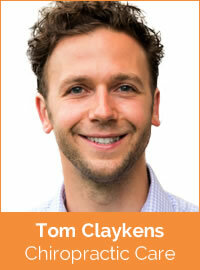 Tom Claykens is a chiropractor who specialises in Functional Neurology. He was introduced to chiropractic at the age of 15 when he borrowed a book from a chiropractor who fixed his stepmother’s shoulder. Tom wanted to specialise in Functional Neurology to fully understand the neurological processes happening throughout the human body. His specialism enables him to treat various neurological disorders that are often the cause of acute and chronic health problems. Tom also enjoys teaching students and colleagues in the field of chiropractic. He developed a post-graduate teaching program for other chiropractors teaching Functional Neurology, currently taught in Leiden, The Netherlands and in Barcelona, Spain. He is also a guest lecturer at the Barcelona College of Chiropractic where he teaches neurology and clinical skills. Tom has a Masters degree in Exercise Sciences from the University of Leuven in Belgium and a Masters degree in Chiropractic from Bournemouth University. In 2014, Tom became a Diplomate of the American Chiropractic Neurology Board (www.acnb.org).